(Nanowerk News) University of Missouri School of Medicine scientists explain a potentially new early cancer detection and treatment method using nanoparticles created at MU in an article published in the Proceedings of the National Academy of Sciences ("Bombesin functionalized gold nanoparticles show in vitro and in vivo cancer receptor specificity"). The article illustrates how engineered gold nanoparticles tied to a cancer-specific receptor could be targeted to tumor cells to treat prostate, breast or lung cancers in humans. "When injected into the body, the Gastrin Releasing Peptide (GRP) cancer receptor serves as a signaling device to the gold nanoparticle, which allows for targeted delivery to the tumor site," said Kattesh Katti, PhD, who wrote the article with Raghuraman Kannan, PhD. "Consequently, the radiotherapeutic properties of such nanoparticles also provides valuable imaging and therapeutic tools that can be used for early cancer detection and therapy in various human cancers." 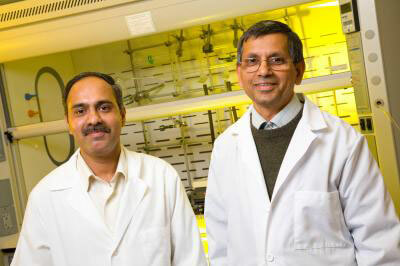 Raghuraman Kannan (left), and Kattesh Katti, faculty members in the department of radiology at the University of Missouri, have discovered gold nanoparticles that could be used to treat a variety of cancers. Because GRP receptor mediated imaging and the radiotherapy specifically targets cancer cells, patients could benefit from a more effective treatment with fewer side effects. GRP receptors are abundant in prostate, breast and small lung cancer cells, and the effectiveness of Katti and Kannan's gold nanoparticles has been proved in numerous studies. "The development of GRP-receptor specific gold nanoparticles and proof of cancer receptor specificity in living subjects, as described by Drs. Katti and Kannan, is a significant and critical step toward the utility of engineered gold nanoparticles in molecular imaging and therapy of various cancers," said Institute of Medicine member Sanjiv Sam Gambhir, MD, PhD, Virginia and D. K. Ludwig Professor, as well as director of the Molecular Imaging Program and Canary Center for Cancer Early Detection at Stanford University. Katti, Kannan, and others with the MU School of Medicine Department of Radiology have been researching the development of tumor specific gold nanoparticles for more than five years. "This discovery presents a plethora of realistic opportunities for clinical translation, not only in the development of nanomedicine-based diagnostic technologies for early stage detection but also for therapies for treating tumors in prostate, breast and small cell lung cancer," Kannan said. Kannan and Katti have developed a library of more than 85 engineered nanoparticles for use in molecular imaging and therapy. With scientists at the MU Research Reactor (MURR), the most powerful university reactor in the world, they have developed cancer specific therapeutic radioactive gold nanoparticles. MURR is one of only a few sites worldwide able to produce cancer targeting gold nanoparticles.